Some of the ocean’s most colorful inhabitants – including corals, sea snails and many kinds of plankton – will face the risk of extinction over the next century as global warming acidifies the world’s oceans, according to a new assessment by an international committee of scientists convened by the United Nations. All marine species that build their skeletons or shells out of calcium carbonate are at risk, as well as other species that depend on them for food, according to Richard A. Feely, a marine chemist with the National Oceanic and Atmospheric Administration in Seattle, Washington. “We don’t know the long-term impacts, but since many of these organisms are primary food sources for fish, the cascading impacts could be very severe,” he says. While they’re not certain how marine life will respond to an acidifying environment, scientists say there is little doubt that emissions of greenhouse gases are indeed altering the pH of the oceans. The recently released report uses decades of surface water pH measurements, since before the pre-industrial era, to predict sharp increases in ocean acidity in the years to come. A key reason why researchers are so confident in their prediction is that the chemistry behind the emissions-acidification connection is very well understood. The carbon dioxide in our atmosphere pushes constantly toward equilibrium with the amount dissolved in the ocean. Eventually, about one quarter of the carbon dioxide that we are dumping into our air will end up dissolving into the seawater. On entering the ocean, carbon dioxide forms three different molecules: carbonic acid, carbonate, and bicarbonate. The influx of carbonic acid increases the amount of hydrogen atoms in the water, and its acidity. This cycle has already lowered the ocean’s pH by 0.1 units since pre-industrial times, and the U.N. panel predicts decreases of at least that much more by the year 2100. Marine organisms are especially sensitive to changes in environmental acidity. Although scientists have only just begun to study the impact these changes are having on ocean wildlife, many are ready to name some indisputable victims. “The data is clearest for corals…corals are in big trouble,” says Ken Caldeira, an environmental scientist at Lawrence Livermore National Laboratory near San Francisco. Corals are tiny fleshy polyps, only a few millimeters long, but the part we usually see is the hard, colorful shell that they excrete around themselves. Within the pockets and grooves of the coral crust live colonies of algae called Zooxanthellae whose photosynthetic processes gown the corals in brilliant colors. They pay their rent by being excellent housekeepers, providing nutrients and aiding in the calcification of the corals. To make their shells, corals must take in sufficient quantities of calcium carbonate from the water. However, the amount of calcium carbonate available to corals depends very much on the amount of carbonate ions present. 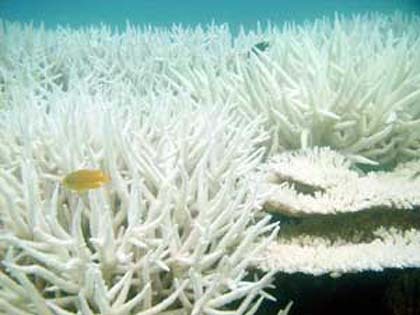 As carbon dioxide invades the oceans and increases levels of carbonate, the corals are deprived of building blocks for their shells. As the climate changes, the ocean is also slowly rising in temperature. The warmer water gets, the harder it is for carbon dioxide to dissolve in it, which would logically mean that as the ocean warms it slows the change in pH. However, Caldeira says we cannot count on temperature changes to alleviate acidification. “It turns out that the temperature effect is almost independent of the ocean acidity effect,” he says. Corals have been the most visible victims of this process. But in reality, every ocean animal with a calcium carbonate skeleton is vulnerable. Many of these, like plankton, are fundamental links in the food chain. Researchers dispute whether annihilation of these species would cause a massive ecosystem collapse. It’s difficult to predict how marine life will respond in the coming decades because most experiments on ocean acidification are done in a laboratory and cannot fully simulate the complexity of the ocean’s ecosystem. “Nobody really knows because nobody has taken a piece of ocean and changed the pH for an extended amount of time,” explains Caldeira. It’s nothing to dispute about. A species which disappears means a trophic chain disability, in a long shot it implies – bang bang – huge dysfunctions in the natural habitat of all the animals. It’s that simple.